Here at Axess 2, we take a new approach for your new ‘Homelift’, we are passionate about the ‘design’, we want your new homelift to fit and blend in with you home and become a luxurious addition, and be practical in it use. Bringing our expertise and knowledge, from our large elevators and passenger lifts, we focus and use the same design and technology from these products in all of our domestic lifts, including colour changing RGB lighting, Bluetooth and wireless diagnostics of the lift controller, security and safety components, to make the lift for your home, one of the most advanced safe products on the market. Axess 2 offer a full design service, with free design consultation, with our in house team, we can give you a luxury homelift with bespoke solutions, regarding cabin design and landing door solutions. If your homelift is for an existing property, we have a range of low pit and low headroom lifts, with speeds from to 1 metre / second (depending on lift type and regulations applied) according to EN81-21 or EN81-41. We manufacture in the UK a full glass lift structure, that can be bespoke design to work with most of our products, we offer full glass sliding doors, all one touch controls in our fully enclosed cabins, bespoke design solutions, using materials from Steel Color, or vinyl wrap solutions. Most of our domestic elevators, can do multi floors, and 3 way door configurations. Please call us today and start you lift design dream. Whatever your need for a home lift may be, we can accommodate all of your requirements; whether you’re looking to install a through-floor lift for accessibility purposes, or if you’re simply looking to increase your property value by giving your home a unique and luxurious feature, Axess2 cover all angles, helping you to enhance your home. The ‘Leonardo’ electric traction domestic lift is perfect for virtually any home installation. With starting dimensions similar to that of closet space, an eco-friendly design, and energy savings using our innovative lift technology, this residential elevator makes the perfect addition to any household. This modern Leonardo lift is the first of its kind to have its own automatic sliding doors as well as low headroom; with this in mind, this home lift offers low operation costs. Equally suitable as a disabled lift or as a stylish addition to a home, this is a premium lift that is one of the most configurable in our range. The Expressa Stair Lift comes with various customisation options such as side access and electrical emergency lowering; it’s an extremely popular domestic lift. If you are requiring a lift that needs very little space, then this is the solution for you. 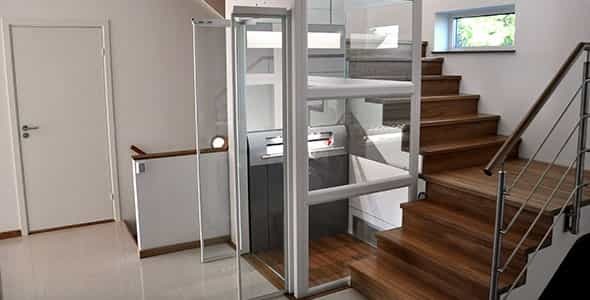 Featuring a foldable platform for use as an attachment to stairs both indoors and outdoors, this non-intrusive and minimally designed home lift is ideal for those wishing for convenient elevation assistance. Benefit from this lift’s flexibility; with options to be installed on to either a straight staircase or a staircase with a gradient ranging from 15° to 45°, it’s a highly versatile choice. Its unique design also enables it to stop at a number of access points. There’s no building work required and the lift won’t interfere with existing interior design. Boasting tactile and visual press-and-hold buttons, as well as run-to-hold buttons with key switches, it’s no wonder that this lift is a best-seller. Axess2 is proud to be able to offer you three tiers for home lift pricing. The first tier is where you’ll find our affordable lifts. These lifts start at just £12,000, and include the extremely compact Qube home lift, renowned as the smallest domicile lift on the market. This takes up no more space than your wardrobe does, and is ideal to be incorporated into homes where space is at a premium. The second tier is where you’ll find our luxury home lifts. Prices for these lifts start at £18,000 – only the same price as a new kitchen or bathroom – but for this you’ll benefit from the very first lift that’s uniquely and totally designed for your home. You can also utilise our innovative Lift Builder tool to journey through the process of creating your lift the Axess2 way. If you are requiring a lift that needs very little space, then this is the solution for you. If, however, you’re searching for something that’s tailored to your most exact specifications in every last detail, you can do so today with our third tier bespoke service. Prices are on request, and the bespoke designs that we’ve created in the past truly belong in the galleries of the rich and famous, so you can be sure that your bespoke lift will do as well. Whatever price range your request falls within, Axess2 can make it happen. Axess2 is dedicated to ensuring that you have the best high-quality service both off-site and on-site. What makes us unique is our incorporation of innovative domestic lift technology, which allows for a faster and more efficient installation process. Don’t settle for excavations or messy groundwork – with Axess2, we eliminate the need for this long and disruptive step in the creation of space for hardware due to our superior home lift designs. See our low pit lifts for more information. We have a range of traction and hydraulic home lifts with fully enclosed cabins, offering all of the comforts of a conventional passenger lift at a fraction of the cost. Our innovative lift technology has been incorporated by many of our customers who are delighted with the outstanding results that we have provided for them. You can trust Axess2 to install a residential lift that is both practical and perfectly suited to your every need. We are also truly unique in being able to provide genuinely bespoke domestic home lifts. We adhere to all required regulations, as we are linked with the government run Construction Line, CHAS and LEIA MEMBER, and also have all of the authorised certifications (such as BSI ISO 9001, BS OHSAS 18001 and LiftCert), to create the ideal lift solution to meet your needs. If you would like to read more about our accreditations, please read our brochure. From size and style to floor and finish, you can customise an Axess2 lift however you like. For example, the ‘Leonardo’ electric traction home lift is available in many finishes, with cabin and door stainless steel, interior cabin panels and cabin floors to give your home lift that extra personal touch. We are always happy to offer help and advice in choosing the most suitable domestic elevators, through-floor home lifts, wheelchair lifts, platform lifts, passenger lifts or home lifts; just get in touch with the Axess2 team today. With a quick site visit we can help you envisage how your residential lift will look and operate. We can also provide detailed product information and drawings.